October 2, 11 a.m. - 12 p.m. Many students approach their teaching assistantships with little to no training or experience in teaching. This often causes stress and anxiety over their responsibilities, and can negatively impact students' learning. The Teaching Assistant Enrichment Program (TAEP) is a one-year (September to May) nationally accredited1 teaching program created specifically for undergraduate and graduate teaching assistants. 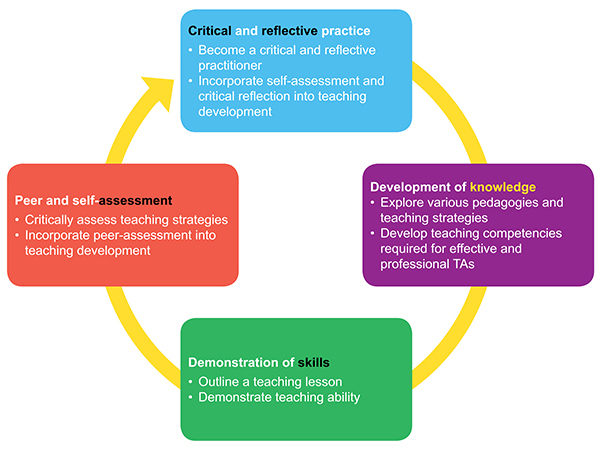 The TAEP includes workshops, teaching exercises, reflection on teaching and learning, and recognition of a student's work towards the development of their teaching skills. The Program offers students experience, knowledge, concepts and skills that they can apply to their current teaching assistantships. The TAEP is a separate but complementary teaching development program to the Certificate in University Teaching and Learning (CUTL). Much like the CUTL, the TAEP has distinct competencies and requirements that students must complete to receive recognition for their TAEP participation. *The TAEP framework was created using the Framework for Teaching Assistant (TA) Competency Development as a guide, which was created by the Teaching Assistant Graduate Student Advancement (TAGSA) group of the Society of Teaching and Learning in Higher Education (STLHE). To learn more, please see: Korpan, C., Le-May Sheffield, S., & Verwoord, R. (2015). Teaching assistant competencies in Canada: Building a framework for practice together. CELT, 7, 219-30.